Summary: A nutrition therapist presents a sensible guide for parents on how to help their daughters avoid eating disorders, introducing a series of specific tools, techniques, and examples designed to help teenage girls deal with the issue of weight and develop healthy, lifetime habits. Original. I picked up this book used years ago but never got around to finishing it till now. It is all about helping your tween or teen girl to develop a healthy relationship with food. In Part 1 you are introduced to the science of adolescent eating including what’s normal eating for girls in puberty, what influences food choices, different kinds of hunger, exercise, dieting and more. Part 2 includes family meals, importance of cooking, breakfast conflicts, junk food and snacking. Part 3 is about the family’s role and includes parental responsibility, dad and mom’s roles, siblings’ roles, what to do if YOU struggle with food and weight and how to handle holiday eating. Part 4 is what to say and do when helping your daughter in certain situations like when she uses the bathroom scale, when she loses or gains weight, when she says she looks fat and ugly, when she is teased about her weight and more. Part 5 covers the basics of eating disorders. The book does a good job of giving advice on potentially sensitive subjects. I shared some of what I read with my daughters (especially the parts about different types of hunger) just as it suggested. It helped me to learn what I could say that would helpful and what responses would hurt. The book focuses on staying curious which means asking questions that allow your daughter to open up and share how she’s feeling, instead of putting your thoughts in her head. Recommended for parents of girls ages 8+. 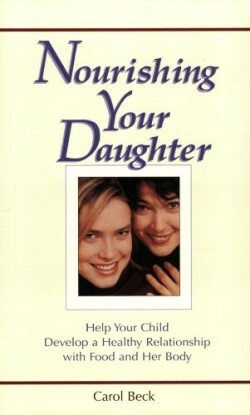 Buy Nourishing Your Daughter from Amazon.com and help support the blog.